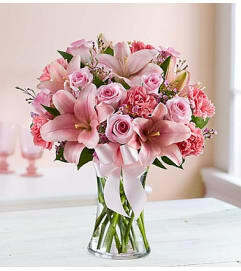 Expressing congratulations perfectly to the new parents on the arrival of their beautiful baby girl is easy when you send this gorgeous basket arrangement of lilies, roses, carnations, daisy poms and more, accented with a stylish pink ribbon. We’ve also included our exclusive plush monkey for baby to cuddle. 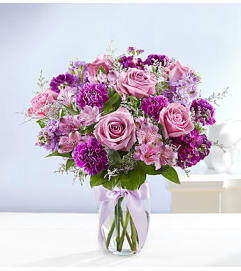 Hand-crafted arrangement of roses, lilies, carnations, daisy poms, poms, solidago and variegated pittosporum. 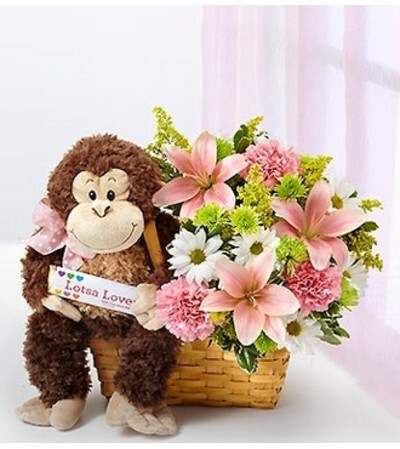 Adorable plush monkey measures 11"L and is safe for all ages.